Don't miss the chance to know some of the main attractions while you are visiting Madrid with this two-in-one tour. 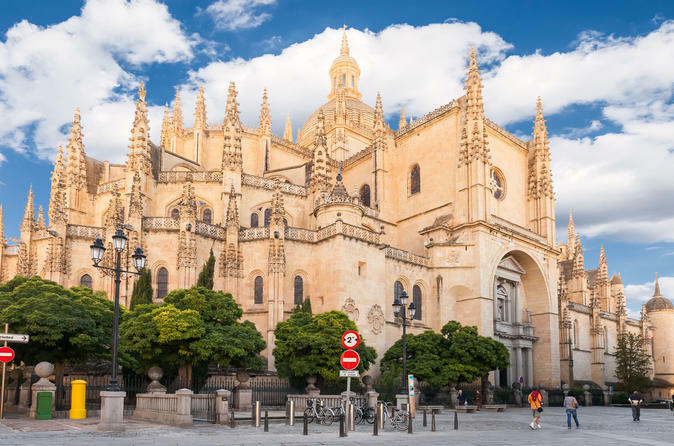 Get to know Toledo and Segovia. Also, take a walking tour in Madrid. First day you will do Toledo and Segovia full day Tour. Second day you will do our Madrid Walking tour in the morning. In Segovia you will get to know the aqueduct, Alcazar and the Cathedral of Segovia. The aqueduct measured about 15 km and takes water near the actual marsh of Revega. The Azoguejo Square is the best known and best preserved area. Then, schedule in a different day, you will meet the most important points of Madrid in a walking tour. Please note that the walking tour is available only Wednesdays and Fridays. You will start at the iconic Plaza Mayor. The Plaza Mayor is located in the center of Madrid, a few meters from the square of Puerta del Sol, and close to the High Street. Another interesting point on this tours is the Gran Via, you will visit the most famous street in the city of Madrid and knows the daily life of the people living in this city. Let amaze yourself with the colorful and spectacular source of trade. Another interesting point on this tours are Puerta del Sol, the Metrópolis building, the Cibeles, the City Townhall or the Puerta de Alcalá. You will finish the tour at Retiro Park, where you will have some free time to enjoy it on your own. Special Offer - Book this tour and save 20% compared to booking each attraction separately! - Book Now!